While having EXIF data available to the local user is nice, not everyone wants EXIF data to be included in pictures they share online, particularly if they contain location information. For that reason, many photographers like to strip EXIF data from their images, something which is quite easy to do with the help of a separate Mac app. Another option is to disable location data on the iPhone Camera completely, which would prevent the user from having to remove that data or worry about it to begin with, but doing so would prevent some of the kind of fun features like being able to tell exactly where a picture was taken, something that can be done with Photos app and Preview in Mac OS X. How do you fix the location on a given picture or add a location for that matter. Got some pictures with wrong location or no location at all. It was possible with iPhoto before. Tks. I removed the photos app. I still have previewer, and I have Adobe photo editor. Do you know how I may view, edit, and remove EXIF data? Yes you can check EXIF data with Preview app as well. If you are using Adobe software (Lightroom, Photoshop etc) the ability to strip EXIF data is built into the app. You might have to do some poking around to lean how. Command + I (Show Inspector) works in Preview. or you can use GIMP or paid macphun editor as well. Still wondering why there isn’t a way to edit location data and geotag photos that are missing a location. Hopefully it will come with the next update? 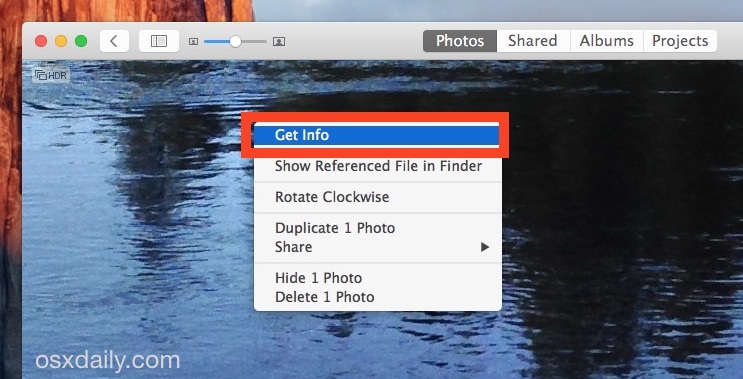 If you copy a picture or movie, for example to another place on mac or to a external drive, it then changes the date to the date you made the copy. Is there a way to see when the pic or video was actually taken? I spoke with Apple about this and they suggested I submit a request for the next iOS update. Did you find an answer to this question, as it drives me mad that this happens? I wondered whether installing a separate app would help but this does seem a bit extreme. Hi Mike and Beverly, I’m interested in this question too as I need to upload some photos to a deposit protection company as part of a property dispute and I need to show the actual date on which the photos were taken. At the moment each time I move the photos out of iPhoto, it puts today’s date on them as when they were created and modified! Grr! I am also interested in this question. Is there a separate app, extension or Applescript that can change the date back to the date taken? 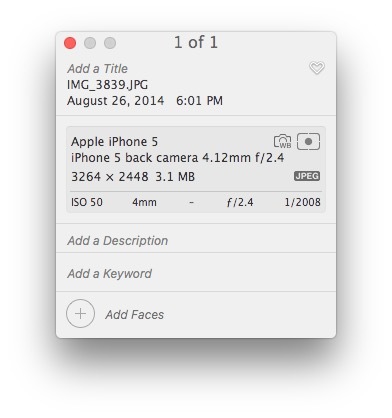 Or a way to see the complete EXIF data within Photos OS X? Has anyone requested this for the next update? My solution works for Mac, so hopefully you can repeat it, or find a similar solution if you’re on PC. 2. Select the photo image in “photos” (NOT finder) once it’s imported – then use “control click” to get the pop up menu and then “get info”. Essentially it seems to recognise differently coded metadata and gives all the info you want – from the actual date taken, to whether it was front or back camera on the phone, and all sorts of information that is unavailable when viewing “get info” simply in the finder copy. Does anyone know if it’s possible to move the Info window off of the center of the photos? In iPhoto I would use the info as I was deciding which photos to transfer to other places. Now, I can’t see the photo to decide because the Info window is covering it. Arghh! I am frustrated by exactly the same issue and have been searching forums to no avail! Locating the window directly in the middle of the photo is ridiculous! Very hard to refer to the photo to put in an appropriate keyword or a description. Can someone offer any insight?? I have to say I prefer the old iPhoto. I do not want to have to click on each photo for info. I want the name displayed permanently for each photo as it was in iPhoto. I also want to be able to split moments so that I can separate photos I get from my children – not have them meld with mine. It is very frustrating searching through photos to locate what I want. Bring back the functions fro iPhoto!! Editing is not as good either – the vignette is nowhere near as good as it was. I liked that i could extend the fog (black or white) this is no longer available. Hoping you can bring back the options we had with iPhoto! Exif data does not seem to be available for photos taken with a DSLR and processed in Adobe Lightroom 9or PS) then imported to Photos app. Any suggestions? It’s possible that Adobe Lightroom or Adobe Photoshop stripped the EXIF data as part of the processing and export procedure, you’d have to check the settings for the Adobe apps and how they handle EXIF metadata respectively. I don’t use Lightroom so I can’t offer any advice there, I stick to Photos, Preview, Pixelmator, and Photoshop. Double-check that the pictures are missing EXIF metadata by opening the image in Preview for OS X, then using the “Tools” > “Show Inspector” tool, in the inspector info window, click on more info and exif to see what data is in the pictures. If it’s in Preview, it will be visible in Photos but the library may need to be rebuilt. This “Get Info” used to work to show EXIF data. It stopped in January 2016. Was there some sort of update? I REALLY want it back to compare photos from different cameras. But I need the data! By the way, I did not open these first in Lightroom, which, as mentioned above, may have stripped the info. I used to be able to view the photos’ data when looking at a picture on my Mac. I CAN get the info under “properties” on a Window computer. They haven’t f**ked with it as Apple apparently has! quick question – geo-tracker is enabled and we can see the coordinates but when emailing photos – coordinates do not come across…. any suggestions? When Editing pictures – Having completed the editing of one picture, the top right corner defaults to ‘Details’ and it is necessary to go to Image and reset Edit every time. This was not the case a few weeks ago. How do I change the default please? 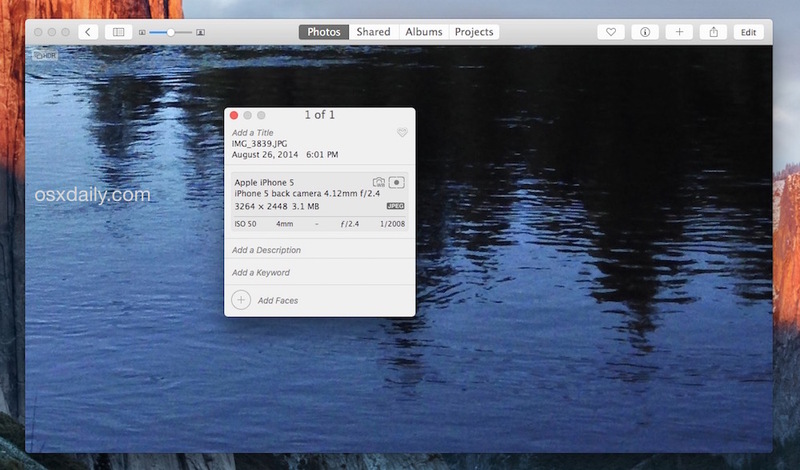 Yes you can extract EXIF metadata from images that are received or sent by text messages. 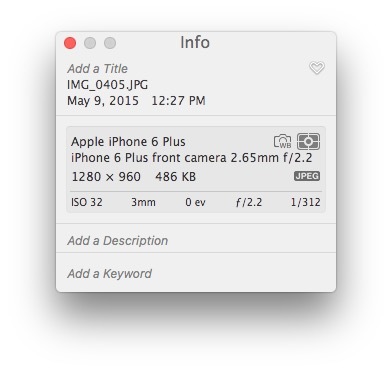 What I REALLY want is a Service that will let me right-click in the Finder to see EXIF info. Anyone know of such a thing? This is posted in 11/11/2017. Can I include the file name when I import my photos to Photos? How can I show the file name under each image? I was told by Apple rep that Photos only show title under each image and the title field has to be entered manually for each image. I have 50K photos and each has unique inventory #. Therefore, the filename (inventory #) is crucial to me. Does anyone find that not able to display the filename a problem? Does anybody know of an app for Mac that shows camera info for video? I’ve used this app for years and years, and it’s the best at what it does. Period. $20, or better…$35 bundled with two other must-haves: A Better Finder Rename (again, the best of its class) and Big Mean Folder Machine, a folder-contents splitter/merger.